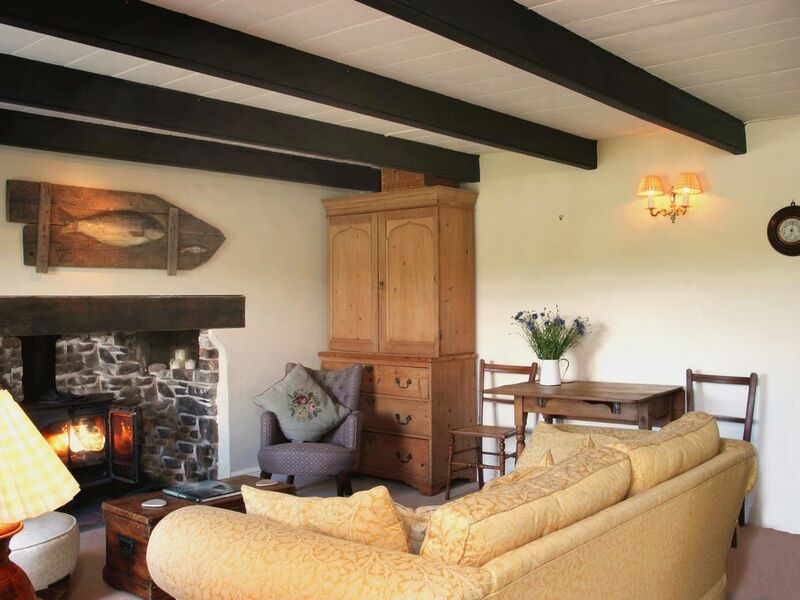 Blythe Cottage is a cosy 3-bedroomed cottage sleeping up to 4 persons. Ideal for couples or families alike, it is a wonderful base for exploring the best of Cornwall. Situated in an attractive raised terrace above the riverside road, the cottage is accessed by a flight of slate steps from the roadside. The raised position blocks out any view of the road from the cottage and the garden, which looks directly over the water. The cottage is homely and well-presented, combining original features of a Grade II listed cottage such as a stunning inglenook fireplace and beamed ceiling with the modern facilities of a more contemporary kitchen and bathroom. Furnishings throughout the cottage are traditional in style, with many antique pieces and original artwork. The colour scheme is neutral with designer fabrics such as Malabar and Osborne & Little. The small front garden has a terrace and a lawn area, and is ideal for al-fresco dining and barbequing. Or just relaxing with a cup of coffee or glass of wine watching the ebb and flow of the tide. In the winter the woodburning stove heats up the entire cottage. In addition, there is a night storage heater in the sitting room with convector booster. Upstairs there are electric fan heaters if required. Our two cottages sit side-by-side, raised up from the road by about 10 feet, with glorious views of the confluence of two tidal rivers. It's a perfect place to relax and watch the ebb & flow of the tide. Set in an area of outstanding natural beauty the cottages are tucked in to the side of the hillside so are well sheltered from the prevailing winds and have a southerly aspect from the front terraces to get the very best of that view. The cottages are homely and well-presented, combining original features of a Grade II listed properties such as a stunning inglenook fireplaces and beamed ceilings with the modern facilities of a more contemporary kitchen and bathrooms. Furnishings throughout the cottage are traditional in style, with many antique pieces and original artwork. Malpas has a popular pub, the Heron Inn, which is less than 1 minutes walk from the properties which serves delicious food and is the perfect retreat after a long car journey. There's a small passenger water ferry that runs throughout the spring/summer seasons from which you can embark on from the local marina, not 100 metres away. From here you can explore the hidden treasures of the Truro river, visit Falmouth, St Mawes or take a walk around the beautiful unspoilt gardens of Trelissick House, a local National Trust property. There are other beautful walks from the doorsteps of the cottages along the creekside edge (either up or downstream), Perfect for building up your thirst or that of your pooch! Whilst there's so much to enjoy on your doorstep, on the following pages we've listed some of our favourites to get you started. Whether it be for a short break escape in the winter, or for a week or longer booking later in the year we feel confident in saying that you will love staying here and, like most of our guests, will want to come back again and again. We've been visiting Cornwall regularly for about 15 years since we first discovered the Fal estuary, and subsequently discovered Malpas, finding it the perfect place to access both coast lines depending on what our mood was and which way the wind was blowing. The initial plan was to move down, though as is often the case, life gets in the way and plans change! We still spend as much time as we can in Cornwall throughout the year and look forward to the day when we can come and go as we please. We are a family of 3 most of the time with 3 slightly older children who have grown up enjoying the cottages and regularly visit us during longer stays. Superb character cottage with the most amazing views. Extremely well equipped. Kitchen small but with everything you could possibly wish for. Incredibly comfortable bed with a wonderful view. Modern bathroom, big flurry towels and plenty of hot water. Lovely outside space with table and chairs. If you don't feel like cooking head to the Heron Inn where you will find a very warm welcome with incredibly tasty food. The properties are located in Malpas, a picturesque, small village accessed from Truro via a road that skirts through trees alongside the Truro river. Malpas village itself comprises of some 80 houses in total. There is a popular pub that opens 7 days week and serves good food, a small church, a marina from where a passenger ferry that operates April-October. That's it.